In 1964, on the brink of the British Invasion, the music business in America shunned rock and roll. There was no rock press, no such thing as artist management -- literally no rock-and-roll business. Today the industry will gross over $20 billion. How did this change happen? From the moment Pete Seeger tried to cut the power at the 1965 Newport Folk Festival debut of Bob Dylan's electric band, rock's cultural influence and business potential have been grasped by a rare assortment of ambitious and farsighted musicians and businessmen. Jon Landau took calls from legendary producer Jerry Wexler in his Brandeis dorm room and went on to orchestrate Bruce Springsteen's career. Albert Grossman's cold-eyed assessment of the financial power at his clients' fingertips made him the first rock manager to blaze the trail that David Geffen transformed into a superhighway. Dylan's uncanny ability to keep his manipulation of the business separate from his art and reputation prefigured the savvy -- and increasingly cynical -- professionalism of groups like the Eagles. Fred Goodman, a longtime rock critic and journalist, digs into the contradictions and ambiguities of a generation that spurned and sought success with equal fervor. 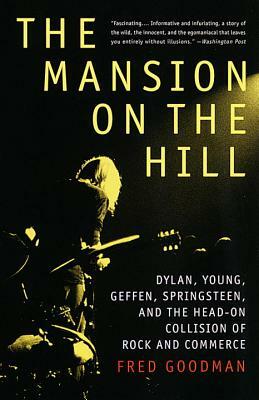 The Mansion on the Hill, named after a song title used by Hank Williams, Neil Young, and Bruce Springsteen, breaks new ground in our understanding of the people and forces that have shaped the music. Fred Goodman is a writer specializing in the music and entertainment business. From 1987 to 1990 he was a senior editor at Rolling Stone, where he is now a contributing editor. He has written for The New York Times, Vanity Fair, GQ, M, and The Village Voice. He lives in White Plains, New York.